Simply Human...: An Evening With Her. The sand rejoiced as they haven't seen such a beauty so close, they clung on to her naked feet, to touch her gentle skin as if it was their long forgotten wish. She was beautiful and so was she kind as she let them touch her feet without any bother. She giggled and hummed some old song while a small silver double ring on one of her toe’s shined brighter than the silver moon up above. Look, look how is my new shoe, she asked me with a playful smile pointing to her feet dug into the sand making her own sand shoes. She started swinging back and forth, enjoying each moment and dragging her legs on the white sand occasionally to feel its warmth. The odd creaking sound of the chain disturbed the air which was silently listening to her song without any movement. They suddenly rose from the trance and started moving gently through the palm leaves that stood around, then to the swing post and finally down to kiss her black hair. 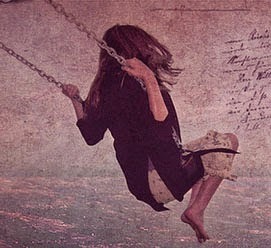 She pressed her toes hard on the sand and carried the swing as high as she could. It felt like she flew up to the sky and touched the full moon with the tip of her nose. The breeze still roamed around her as she stretched her legs straight and lay back facing the sky, swaying back and forth in that graceful posture. She was still yet was dancing; the stars who were watching her from above couldn’t resist joining in and so they started dancing as they desired, forgetting their positions in the sky. Her hair dangled down and moved opposite to her motion in objection to her not letting them join with the stars, they slightly touched the sand below and invited them to join their dance. The sand was so happy as they enjoyed the dance and then turned to the sky to taunt the stars, saying that the tiny, shine less they were dearer to her than the ever twinkling them. It was all a treat to my eyes as I sat in the swing next to her idle and amazed, thinking to myself that how lucky I am to have her.